Why it’s time to panic about the power of big technology. Why it’s time to panic about what Google and Facebook are doing to our lives. 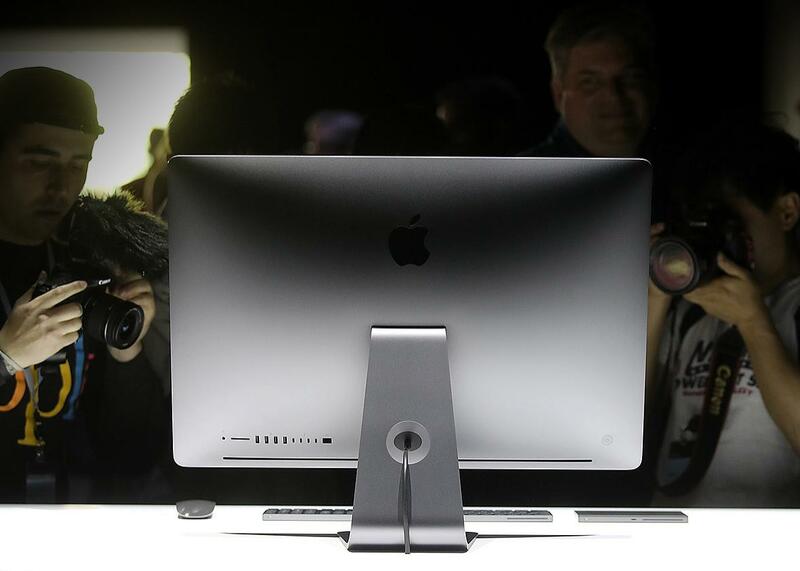 The new iMac Pro is displayed during the Apple Worldwide Developer Conference on June 5 in San Jose, California. Last week at Books Inc. in San Francisco, I interviewed Franklin Foer, a national correspondent at the Atlantic and the author of a new book, World Without Mind: The Existential Threat of Big Tech. Foer, whom I worked with for many years at the New Republic, has written a polemic that seeks to call attention to the ways technology is changing human beings and human interactions. He couples this critique with another, related one: Big technology companies not only control more and more market share; with their data, they also hold increasing power over our lives. Below is an edited transcript of our conversation. In it, we discuss why this panic over technology is different than previous ones, what the internet is doing to journalism, and whether Facebook can fix some of the problems that bedevil our democratic fabric. Isaac Chotiner: We tend to think of existential threats as being things like global warming or nuclear weapons. Why should we be thinking of technology in these dire terms? Franklin Foer: I’m not arguing that we should think about technology per se in these dire terms. I’m arguing that we need to think about our present course with technology in those terms, because our lives are increasingly dominated by a series of big companies that have achieved something close to the state of monopoly. They have a vision for humans, and they’re trying to lead us to that vision, which they’re able to do because of their enormous economic power. What concerns me about this trajectory is that we’re giving up a lot. We’re getting a lot. There’s no doubt that we’re getting a lot. The iPhone is an incredible invention. Google is arguably one of the greatest inventions. The search engine is one of the greatest inventions in human history. But we’re also sacrificing enormous things. The magical qualities of these pieces of technology are things that we enjoy, but they also tend to blind us, so we don’t apply all the skepticism to these companies and to these trends that we would apply to other significant institutions in our lives. The stakes are extremely high, whether it’s in regard to privacy or certain institutions that we hold and that we consider essential for democracy. We’ve maybe arguably always been in the process of merging with machines. We’ve always had tools, and those tools have been an extension of us, but what we’re automating right now are mental processes. These sites shape and filter our world, and they’re going to create virtual realities that we’re going to inhabit eventually. The problem is that we’re not just merging with our machines: We’re merging with the companies that operate those machines. Every time new technology comes along in some form, people worry that it’s changing society permanently, that it’s going to cause us to move into unchartered waters, that we’re entering a brave new world, to coin a phrase. Why do you think what we’re dealing with now is so categorically different than technological changes in the past, even in the 20th century? There clearly have been technopanics, and sometimes we haven’t panicked enough, as global warming kind of highlights. I think there are actually reasons to approach technology in a skeptical sort of way, but let’s consider some of the ways in which these companies are potentially different from some of the technologies that have come before. For starters, they’re so deeply integrated into our lives. Right now, they’re in this race to create personal assistants so that they can wake in the morning and they can guide us through the day. Secondly, they’re just incredibly addictive pieces of technology, and we all know this intuitively in our own lives. There are in fact apps you can use to measure how many times you check your phone, and I shudder to think how many times I check my phone. I’m sure it would be probably in the hundreds of times that I check over the course of the day. It’s not an accident that the technology is so addictive. They’re designed in that sort of way, and part of the reason that they’re so effectively addictive is that these companies have amassed such huge trawls of data. They track us everywhere and they’ve taken that data, and they’ve amassed a portrait of our psyche. They take that portrait and they use it to hook us. I think Facebook is a pretty obvious example of how that works. Facebook is essentially a giant feedback group where they take this information about you and they’re trying to keep you on the site for as long as possible. They sometimes give you exactly what you want. They deliver information that’s designed to prey on anxieties, to create panic that we’re not being good enough parents or that we’re about die from some health threat that we hadn’t considered. It seems like you are saying two different things. One of them is about what this technology is doing to our brains and to us as human beings, and the other is about the power that these companies (Google, Facebook, Apple, etc.) have over our lives. Concerns about monopoly and things like that. What connection are you trying to draw between those things? The alarm bell that I’m trying to sound is that we have these concentrations of economic power in a realm that touches almost every aspect of our existence, and that these concentrations of power are especially dangerous because the forces that are at play are so powerful in our lives and also so crucial to our ability to be thinking human beings. The ways in which our attention gets shanghaied by these companies makes us less good as citizens. We’re consuming a lower quality of information. We’re living lives where I think it’s harder to contemplate the world because we’re constantly distracted, notified, ping-ding-dinged, and we should care about that. What exactly are you recommending? I’m talking in terms of how the government should approach these big tech companies because normally we think of monopoly as something that is steel or an industry like that. Right. These companies are so tricky because they’re basically in the realm of information and their monopolies are so ethereal. The companies don’t really even exist in one place. We see this in the realm of intellectual property, and it’s part of the reason these companies don’t pay a whole lot of tax, because what is one-click shopping? It’s a pattern. It’s an idea. You can stick it in Luxembourg as easily as you can stick it in Seattle for the purposes of accounting. We need to think about these companies differently. They also challenge a lot of our ideas about monopoly. Monopoly is a concept in American political tradition that dates back to the founding. The Founding Fathers didn’t want to just check and balance the power of the state: They were also concerned about concentrations of private power. They were concerned about concentrations of private power because they were worried about the threat that they would ultimately pose to the republic. That for democracy, you don’t want there to be private forces that are able to exert so much control over elections, over the operation of government. That was a really powerful tradition and it extended up through the 20th century. In the 1960s, something started to change, and that something happened on both left and right. The left became obsessed with consumer rights and protecting the consumer, which is a very particular way of thinking about us as individuals. At the same time, Robert Bork, he of the long beard and the failed Supreme Court confirmation, came up with an idea of consumer welfare. He argued the only reason we need to be afraid of big companies is if they treated consumers badly. The only reason to fear corporate gigantism is if companies use their size and their power to jack up prices to achieve monopolistic lengths. That, of course, is something that we should be concerned about. We don’t want companies exploiting us—using their power to charge us more than they should. But at the same time, prices and efficiency shouldn’t be the be-all and end-all of governmental policy. We went through this revolution that reached its apex in the Reagan years, and we’ve never really reverted to form, where we just stopped caring very much about corporate size. My thinking is that we really need to care about size again as a concern for reasons that have nothing to do with price. These companies give you the product for free; or at least in terms of cost, they’re not really extracting anything for you. Google is free, Facebook is free. Amazon is great because its prices are much lower than anything you can get anywhere else. Yet, there are problems. There are problems about the ways in which they intrude into our private lives, the ways in which they have amassed so much data, and that protects them from competition because nobody can amass as they can and achieve the machine-learning system that they have managed to create. Then it becomes a problem in the realm of information where these companies have become the biggest, most imposing gatekeepers in human history. That’s an issue for democracy as we witnessed last November, when it was very graphically illustrated that the quality of information that flows to citizens has been severely degraded. That the filter bubbles that Facebook has created and nurtured have made a lot of people in this country susceptible to fake news, to propaganda, to demagogic appeals. For a long time I think these companies were seen in Washington as generally benevolent actors. Facebook, Amazon, Google, they had very good reputations in Washington. President Obama was very close to the people who ran a lot of these companies. Do you think that’s changing within the Democratic Party and within Washington? Yeah. Well, first of all, they weren’t big scary monopolies then. They were ascendant. They were doing exciting things. They were breaking more. They were behaving in different ways than other corporations had. I don’t think it was wrong necessarily to think about them as different sorts of companies in their infancy. I do think that something has flipped within the Democratic Party over the course of the last several months. You take somebody like Cory Booker, the senator from New Jersey, who got lots of money from Facebook to remake Newark schools. Booker was always thought of a guy who was pro-tech. That’s how he defined himself, but even he has begun to seriously reconsider his stance, and he’s called for a much more aggressive approach towards the big tech companies. I met with somebody from Google and they were saying, “Look, when Cory Booker came out against the tech companies, we just said to ourselves that is now the default position within the Democratic Party.” I don’t think that actually happens to be true. I think that the topic of monopoly and the tech companies in particular is going to create cleavages both on the left and the right. There’s not going to be unanimous opinion in any camp when it comes to their behavior; certainly not when it comes to what to do about the companies. To turn to the fake news aspect: Can you explain why you think it’s so different than in the past? We had yellow journalism 100 years ago. We’ve had people going to the supermarket and buying National Enquirer by the millions for decades. What is it now that you think is particularly different? Well, I think you can think about all those things on a continuum for sure, but a couple things have changed. One is the diminished authority of mainstream media or the diminished authority of any journalistic institution that can provide a common basis of fact. I think we have to say that Facebook and Google, whether they meant to or not, were complicit in the demise of those institutions that provided the common basis of fact. When you go onto Facebook and you search for news, everything there is about the headline, it’s about the photo. It’s not about the source of information. That’s downplayed and it’s a stew. Facebook is a stew. It’s an amalgam of all sorts of different things that are all given more or less equal weight. The algorithm changes from time to time to give certain pieces of information more weight than others. But really when I look at Facebook for news, I see that they are basically propaganda firms that are treated equally to the New York Times or equally to the Wall Street Journal. It’s up to me as a consumer to pay super-close attention to that, but the reality is that for most people, the lines are blurred and the sense of who to trust is diminished. I think that creates this susceptibility. The second thing is just the sheer number of people who use Facebook to get news, which is much higher than the numbers of people who read, say, the New York Post or the National Enquirer. The third element is just the way in which journalism is so financially dependent on Facebook. In order to get revenue, you need traffic. In order to get traffic, you need to be able to master Facebook if you’re a journalistic institution. The values of Facebook end up becoming assimilated by journalistic institutions. How much confidence do you have that Facebook is either able or willing to make changes going forward? One analogous example is Uber, which is just getting pummeled and potentially getting kicked out of London. Or you look at the campaign when people took the Uber app off their phones in order to protest the company. Those actions actually were, I think, extremely important and maybe a bit of an example of something that will happen to Facebook, which is that Uber just hadn’t faced countervailing pressures before. It had a way of doing business that was occasionally lawless, often not great for its employees, and nobody had really stood up to it in any sort of way. I’m not sure London is going to ultimately kick out Uber, but the fact that they’re standing up to it is forcing a measure of accountability in the company. What if the U.S. Senate were to call Mark Zuckerberg to testify and to say, “We’re going to ask you some really tough questions about fake news, about Russian ads, et cetera, et cetera.” Mark Zuckerberg has never really had pressure put on him. He’s an engineer and he’s created this perfect system that is Facebook and he’s always been concerned about the internal beauty and logic of this creation that he’s created. I don’t think that the human implications of what he’s created have often been apparent to him. I think rattling the cage is not a bad thing. In general, what I think I’m calling for in this book is for us to reclaim a sense of agency. That there’s so much about this world, we’re kind of drifting into it. We know big and profound things are happening to us as individuals. Clearly, there are small things that you can do. For instance, there’s this guy who works for Google called Tristan Harris, and I met with him this afternoon and he said, “Well, first turn off the notifications on your phone.” These notifications are engineered to make you to check your thing all the time. You should only want to be notified by a human being, not by an algorithm or by a company. That’s pretty small in the big scheme of things but I do think there’s an idea of resist. His idea, which I think is my idea, is that we need to reclaim a sense of agency, a sense of an ability to control our own lives. One way in which I think about this is a lot is with my kids because when it comes to parenting, you always want your kids to do better than you. I look at the way that my kids interact with technology, and it becomes a mirror to the ways in which I myself interact with technology. I can see the ways in which that addiction and compulsion starts to settle in on them, and it’s much more unnerving to see it in them than it is to experience it myself. I’ve began to think about the ways in which I can cultivate a sense of self-awareness about these forces in the world. Just in general, I think that we’re coming out of a really bleak period. We’re not coming out of it. It’s a bleak period, and I think in general we have this sense that there’s nothing that we can do about certain problems like climate change. Then we have these examples, like the NFL protest, which I found to be incredibly inspiring, just to see a sense of collective action forming against a power that sometimes seems implacable or seems bullying. Why not try to think of the ways we can do this when it comes to information and just the underlying structures of our democracy and the underlying structures of our life?